Mrs Kelly's latest book, My Life in Rostrevor, was compiled by her daughter Bronagh, and is a love letter to the County Down village and to her family. "Before the words you are saying: 'Goodness I hope I remember'," she says. "It depends how you feel. I could write a poem before you would leave, but on the other hand I would be groping for letters to either finish it or not finish it." "But when you get into the way of poems and you sit and write, it clicks and it is nearly saying to you, 'Come on, you can write another one'." Mr Kelly's condition is more advanced than his wife's, but as well as remembering her poems, he enjoys the songs they used to sing together. The ability of both Mr and Mrs Kelly, who have been married for 58 years, to access memories such as poems and songs poses questions about the nature of dementia. 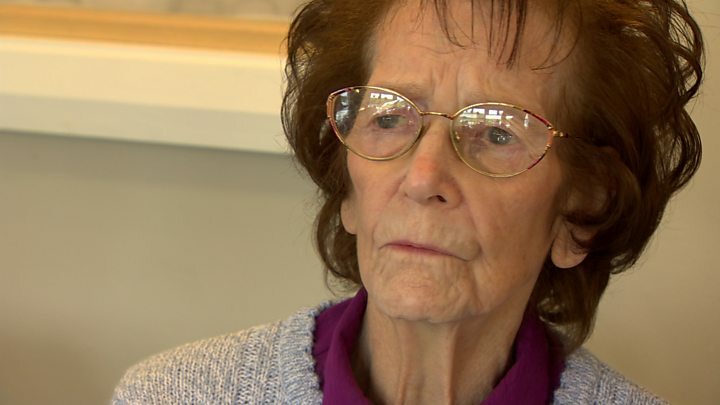 "It is fascinating, it is brilliant for us to have someone like Alice who shows us that life goes on, even with a diagnosis of dementia," says Jennifer Dixon, the activity coordinator at the care home. "She can still remember parts of her childhood and that is what a lot of her poetry and a lot of her storytelling is about. "Everyone just finds it so interesting, she can tell you about things that happened when she was six years of age and it is just fascinating to hear about it. "Sometimes you find someone who might have been a fantastic knitter when they were younger but they have not knitted for years, that skill is still there. "If you just tap into it, it is like riding a bicycle, something they have never forgotten." Mr and Mrs Kelly's connection with poetry and storytelling has proved to be a learning experience for their wider family. "It is amazing, there are times my mummy is not very clear and then all of a sudden she will just say the poems word-for-word," her daughter Bronagh says. "It is just amazing how the mind works." And as for Mrs Kelly, is her third book also her final publication? "I have a feeling there might be a few more stories to tell," she says.